Industrial lighting leader, Larson Electronics LLC, has just announced a new signal light stack, equipped with a waterproof solar panel and four 8aH batteries, emitting red, amber and green light. 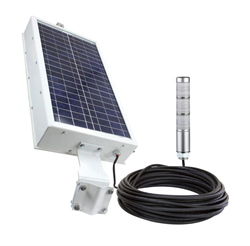 This solar powered signal stack is designed for safety notifications in outdoor locations, and to route traffic in industrial refueling stations. Using this solar powered signal stack light in an outdoor industrial location where traffic may be heavy, is a great, economical and environmentally friendly choice. The WAL-TL-3XTL-C-SOL-100C is a LED stack light that offers illuminative notifications in remote, outdoor locations. The featured solar panel is weatherproof and engineered to catch the maximum amount of sunlight possible. This solar panel boasts a list of features including day/night operation with photocell, a motion sensor for security purposes, an on/off switch that allows manual operation, and flying leads to connect to user-provided external switches. The motion sensor feature is programmed to turn the unit on at night and off during the day, and activates the LED light when ambient lighting falls below 1 lux. This solar powered light stack from Larson Electronics contains four batteries for a 32aH battery bank and 16aH usable. This lead acid battery pack is sealed against potential leaks and contained within the solar panel as one single unit. The mounting options provided for this unit allow flexibility, and include mounting on any flat surface including walls and ceilings. A 100 foot 12/2 SOOW cord is included to connect the solar panel to equipment. This unit is incredibly durable and fit for demanding usage. Constructed of impact and heat resistant ABS resin, and a double-insulated body, this IP65 rated stack light is rugged and suitable for remote outdoor locations with potentially harsh conditions. About Larson Electronics LLC: Larson Electronics LLC is a manufacturer of industrial lighting equipment and accessories. The company offers an extensive catalog of industry-grade lighting and power distribution products for the following sectors: manufacturing, construction, food processing, oil and gas, military, marine and automobile. CPlease see below links for high resolution images and supporting documentation of the product displayed in the release.ustomers can benefit from the company’s hands-on, customized approach to lighting solutions. Larson Electronics provides expedited service for quotes, customer support and shipments.